This book shows you how to achieve business process excellence through change management activities, with case studies from major corporations such as American Meter and the US Navy. 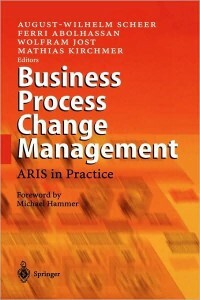 The book defines business process change management as information, communication, and training that enable people to make change and improvements happen. Using case studies the text shows how this change management is applied in practice using a framework like the ARIS House of Business Process Excellence or software tools like the ARIS Toolset.